Yvonne Niami grew up in L.A., the child of immigrants from Mexico. Growing up, her parents would often take her and her brother home to visit family, and Niami found herself moved by the stray, suffering dogs she would find. Decades later, she found a way to reconnect with both cause and place with the founding of her new tequila brand, VIVA XXXII. It all came together on a visit to Mexico as an adult, when Niami found a wounded dog on the streets and decided she had to do something. “He was sadly used in dog fights, and was basically thrown away into the streets after they didn’t need him anymore,” she says. “We took him to the local vet in Mexico who helped him tremendously. They even helped me get the paperwork together to get him across the border.” She then worked to find Ransom, as she had named him, a nice home in Sherman Oaks. 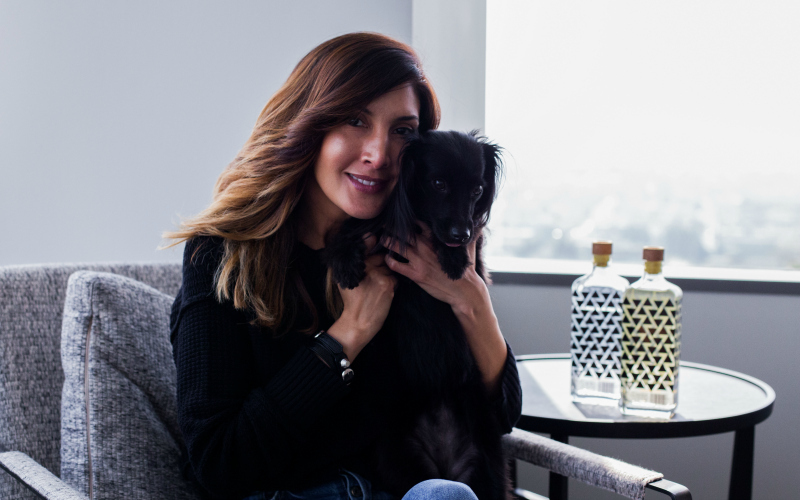 He became the first of a growing number of dogs she has now rescued and placed with families around L.A.
That mission inspired a give-back tequila brand that donates 10 percent of the proceeds from every bottle sold to charities that care for abused and abandoned animals and is committed to supporting the people who craft the product using traditional artisan practices. While it’s still unusual for a woman to launch a distillery, Niami felt embraced by the tequila community. “I think being Mexican, speaking the language fluently, and my passion behind it, helped them welcome me into the business,” she says.